"This ain't nothin' but God!" 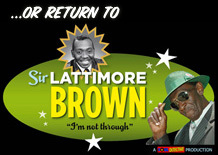 That's right, folks, I've just returned from an epic journey with Sir Lattimore Brown. A journey that took us from the still ravaged Gulf Coast, up Highway 61, through the Mississippi Delta where he was born, and on up into Memphis. It was a profound experience, and one I know I won't soon forget. After many months spent planning and plotting (with a few unexpected twists and turns), I was fortunate enough to join together this past week with producer Bob Wilson and film maker Chase Thompson, and attempt to document Mister Brown's return to the land of the living. Yes, despite the fact that she had mis-spelled his first name, this wonderful young lady (who wishes, for obvious reasons, to remain anonymous) was kind enough to take the time to 'google' Lattimore, and found Jason's site. The Stepfather, in turn, knew that we were focusing on the Sound Stage 7 label over on Soul Detective, and forwarded the email to me. I then contacted my friend Bob Wilson, who had worked with Brown, both in the studio and on the road, beginning way back in 1966. "This is destiny," Lattimore told him once Bob finally got him on the phone, "what else could it be?" When Hurricane Katrina hit the Gulf Coast back in August of 2005, it was Biloxi that took the direct hit... Biloxi that sustained more damage than anywhere else. 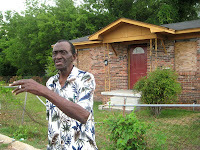 While New Orleans got the press, most of the devastation there took place due to the subsequent failure of the levees. Biloxi was, quite literally, leveled by the storm itself. 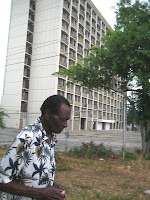 He had been living in Biloxi since 1997, and had an apartment in the building pictured behind him at left. After they had evacuated all the tenants from the building (which was completely devastated, and still remains an empty, hulking shell), he went to the house he shared with his wife, up across the tracks. Lattimore took her to be with her family, and was able to put them on a bus to, what he surely thought, would be safety. He returned to the house to wait out the storm. The water, he said, came up through the concrete floor of the house like it was a 'paper sack', and within a few minutes was up to his knees. By the time he was able to get outside, it had risen up to his armpits. He grabbed a piece of wood, and began trying to swim, but before long the current had twisted his clothing down around his ankles, and he was desperately fighting to stay afloat. He couldn't see any people or houses anywhere. All around him was the swirling, rushing water. Lattimore heard a voice, he told me, of a man he had never seen before. A man that was sent to him 'like an angel'. "You better grab onto one of those trees," he told him, "or you're gonna get swept out into the Back Bay..." A branch was hanging down in the water, and Brown was able to grab it... a wild cat came floating by on a piece of wood and scrambled up the branch, howling and scratching as it perched there on top of Lattimore's head. The voice (which belonged to a sweetheart of a man we were privileged to meet while we were down there named Atlas 'Big Al' Brown - pictured with Lattimore above), told him he had found a wooden pallet and said "I'm gonna push this out to you... either you or that cat are comin' out of that tree!" "Hell, it's gonna be me," Lattimore answered, and he grabbed a hold of the makeshift raft. A Jamaican family in a two story house saw what was going on, and was able to throw out an extension cord to him like a lifeline, and pull him in. He had survived. His wife wasn't so lucky. She died of an apparent heart attack in the midst of the evacuation and, in the ensuing chaos, Lattimore didn't even find out about it until five months later. May God rest her soul. Now living in one of those FEMA trailers, Brown was attempting to put his life back together. In addition to his wife, he had lost everything he had ever owned. A 'service-connected' Veteran of both Korea and Vietnam, he receives a hard-earned monthly benefit from the VA. On one of those 'pay-dates' last year, he was ambushed by three men, who knew he had just cashed his check. Two of them held him down, while a third drove a rusty screwdriver through his side with a brick. Can you imagine? Although that horrific violence didn't kill him, the ensuing infection and internal bleeding almost did. In his delirium, Lattimore was convinced that the thugs had kidnapped him, and that everyone in the hospital was conspiring to keep him against his will. After we first made contact last November, he left his room and went missing for several days before they found him wandering around aimlessly. 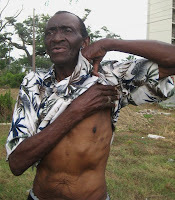 After a transfer to a larger, better-equpped Hospital, his life was saved by a series of operations that removed two of his ribs and drained the infection from his body. Upon his release, he was supposed to enter a 'convalescent facility' (also known as a nursing home) but he never showed up, electing instead to go back to the trailers. We had lost him again. After a couple of months, he called Bob Wilson's cell phone, and we began hatching our plans for the road trip. Everything looked good. That is until that whole formaldehyde thing happened this spring, and the federal government towed away over 35,000 of those trailers in Biloxi alone - one of which was Lattimore's! The news said that many people had been re-located to hotels in the area. 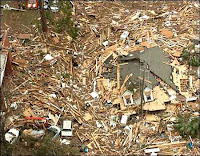 I contacted FEMA, and told them our story. Jim Foster, the 'Lead Public Affairs Officer', told me that he'd see what he could do, but I wasn't holding my breath. 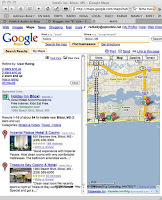 I went to a Google Maps page, and printed out a list of all the hotels in the Biloxi-Gulfport area. Lattimore Brown was registered at the very first one I called... spooky stuff, folks. When Mr. Foster called me back about a week later, he told me that he had been following protocol, and that FEMA was unable to release any information about a person's whereabouts without written consent. He and his staff there in Biloxi had gone out of their way to get that for us, and I'd like to say thank you to him for that... but we had already found our man. As folks told us down there in Mississippi again and again: "This ain't nothin' but God!". You know what? They were right. 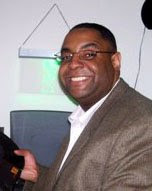 Long Live Sir Lattimore Brown! I am just so thrilled that my blog was part of what is shaping up to be a great story. Thank you for taking the lead on this case and making these things happen. God bless you! It ain't nothing but God. 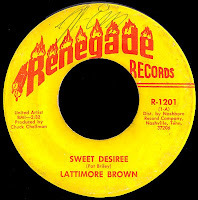 Long live Lattimore Brown! What an Amazing story. I'm looking forward to the follow up. Great story, thank God for that nurse! The man behind 'Shake and Vibrate"!! Great story! Amazing story, Red. Good work! This is a truly moving story, and you are to be congratulated for finding this marvelous man--and introducing us to his gorgeous voice. Bravo! First time a blog has brought tears to my eyes....I hope that your documentary can be completed and distributed, and I hope it helps Lattimore in some way. Wonderful story by caring people. 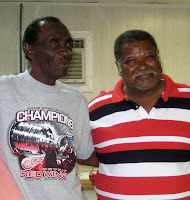 I hope Mr. Brown is doing fine, and wish him all the best. I'm touched by your story Red. The song's lyrics take on a whole new meaning now. Red and Jason, this is unreal! 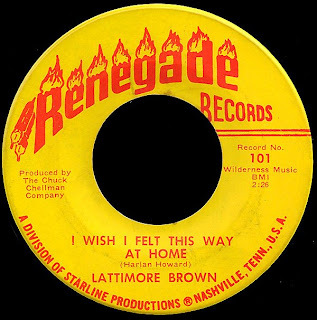 I've been a huge fan of Lattimore Brown for years (got a copy of that Renegade 45 as well as a bunch of others). I'm so excited about this. We've gotta get him up here to New York so my band can back him up! I just discovered your blog today (and The "A" Side as well). I wanted to say that I am impressed and thrilled at the thought and detail you put into your posts. Meaningful and thought-provoking...please keep it up and thanks very much for your efforts in bringing lesser known music to the fore. It is appreciated. What a story. Great work!. I look forward to seeing the documentary on BBC4 in the not too distant future! My best wishes to Lattimore. These Renegade singles are the real deal - well they have the FAME hallmark so they're going to be aren't they? People pay hundreds of pounds for dodgy Northern Soul, and gems like this cost no more than a (good) night out at the local pub. Beats me! God bless Lattimore Brown and you man. Nice story as for me. I'd like to read a bit more concerning this topic. Thnx for giving this data. This the type of story that every soul music loves to read. A marvel indeed. If the Paperboy's band backs him up, I gotta ta be there. He was hot enough at the Stomp with the Checkmates behind him! I have recently met Mr. Brown. He is coming to the Bible Class I teach on Sunday mornings. He is indeed an inspiration to us all. And sometimes he sings for us -- "right out of the blues." Sir Lattimore Brown is very much alive. 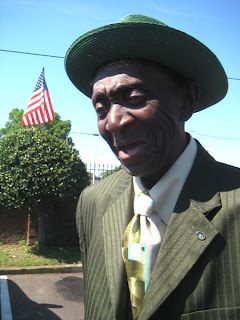 I had the privilege of having him sing to me in March of 2010. His voice is like an angel. He is living on the Gulf Coast. He is an inspiration to all of us.